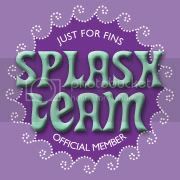 I am a member of the Just for Fins Splash Team. I loved Ruby Red. I didn't think I'd love it as much as I did. I still need to read Under the Never Sky and Shattered Souls. Wow you got so many great books this week I still don't know if I want to read Bloodlines! Love Va but IDK!!! I've read Wake and it's really good so is Bloodlines! Wow, what a stack :-) I haven't read any of those. SUCH A LOVELY HAUL HUN!!! :D You'll love Under the Never Sky, The Sky is Everywhere,Ruby Red, Bloodlines, and Anna and the French Kiss! :D LOL, a misummer tights dream huh? ;D I'M SO JELLY YOU GET TO READ WAKE! :D Happy reading doll! I'm so jealous of Wake I cannot wait to read it! I hope you enjoy everything you got this week! Heres my IMM!! Great haul, you have so many books that i know i would love!! Do you think you will read all those books for review?